The bathroom is one of the most used rooms in your home. It is often overlooked when it comes to decorating, but brightening up this space can help increase your home’s value and lift your spirits every time you enter the room. Use the following tips to re-create this space. Use just one idea for a quick, inexpensive change or go big and splurge on a complete remodel. If your budget and time is limited, you can change your bathroom by swapping out the towels, area rugs, window treatments, and accessories. Choose a totally new color scheme and find towels, rugs, and shower curtains that coordinate in your new hue. Add in wall art, soap dispensers, and toothbrush holders in designs that complement the other additions. This is your chance to transform your bathroom into a whole new style. For those looking for even more of a change, painting the room can have a big impact. Paint is fairly inexpensive, and it allows you to turn a dark room into a bright and airy space. The opposite is true as well. Covering pastel walls in a darker shade can make the room feel warm and cozy. Flooring can also be switched out at a reasonable cost to further change the room’s appearance. Anyone that wants a completely new bathroom can make it happen if they are willing to put the time and money needed into the project. The sink can be replaced with a new vanity. Now is the time to consider a double sink as well. Bathtubs, showers, and toilets can also be upgraded, but keep in mind the amount of space you have to work with unless you want to move walls. 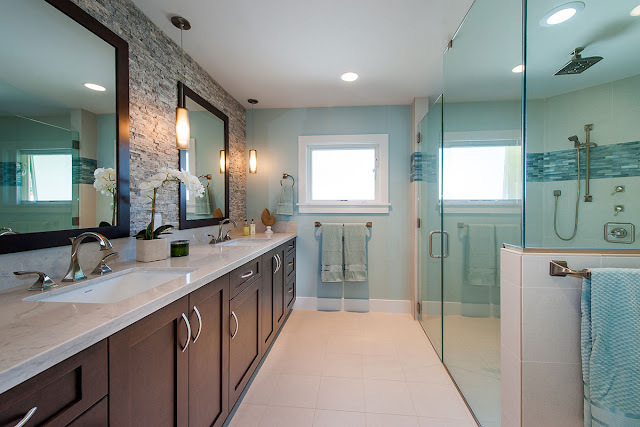 If you are looking for kitchen and bath experts San Diego has many professionals such as those at Teknik Inc. that can help. Whether you simply swapped out a few bathroom basics for a quick change or took the plunge and completely remodeled the bathroom, you will be able to enjoy this space much more than you did before. Keep comfort in mind throughout the process, and you’ll be sure to have created a welcoming retreat within your own home.